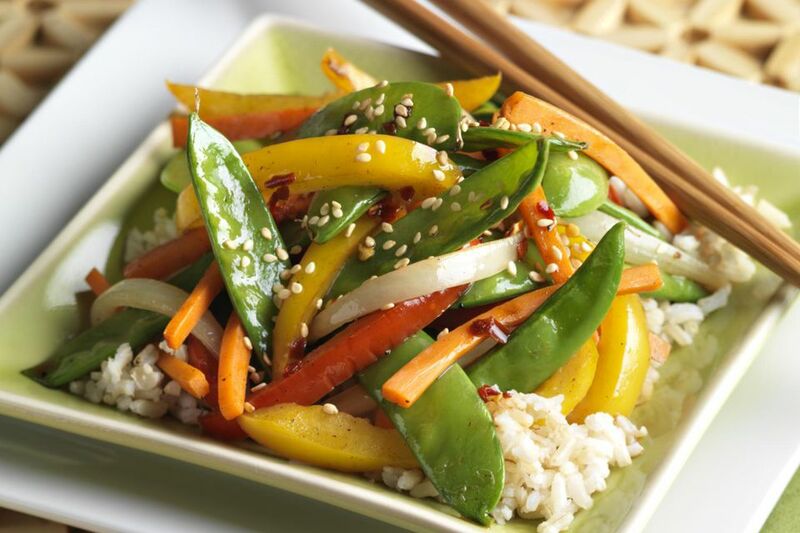 A vegetable stir-fry is a healthy meal you can get on the table in a snap and sure to please the whole family. It is also the perfect dish when you want to use the ingredients you have on hand. But depending on what is in your refrigerator vegetable drawer, you may not feel confident whether a certain vegetable is a good candidate for stir-frying. Will it be able to withstand the high cooking temperature? Does it need a longer cooking time than stir-frying allows? Will it achieve the right texture? Once you learn a few stir-frying rules—from knowing when to add certain vegetables to employing the proper cutting techniques—you will be able to throw together a vegetable stir-fry with confidence no matter what is in the fridge. And don't forget to make sure you use an oil with a high smoking point. Almost any vegetable can be stir-fried, and a successful stir-fry comes down to the density and moisture level of the vegetable. These factors will determine when you should add the vegetable to the stir-fry, or whether you need to pre-cook them before adding to the wok. High moisture vegetables that are not too hard, like zucchini, sweet peppers, spinach, and mung bean sprouts, can be quickly stir-fried at high heat without the addition of extra liquid. Denser, low-moisture vegetables like broccoli and carrots require more cooking time. Many recipes call for the vegetables to be stir-fried briefly and then boiled in a liquid such as chicken broth. Another option is to briefly blanch the vegetables prior to stir-frying. Many vegetables fall somewhere between these two extremes. Snow peas (also called sugar peas and snap peas) have medium moisture levels and thickness; they can be stir-fried dry or finished in a sauce. Asparagus, on the other hand, is a high moisture vegetable but relatively hard and thick, so a liquid is usually added. If you have rinsed the vegetables, or they happen to be from a can (like water chestnuts and baby corn), be sure they are thoroughly drained and dried before stir-frying. Wet vegetables can ruin a stir-fry—the moisture will not allow the vegetables to become crispy and you will end up with a soggy stir-fry. A good tip is to wash the vegetables earlier in the day and then leave them to drain until you are ready to cook in the evening. If you are using different types of vegetables, you want to make sure they all finish cooking at the same time. Cutting the vegetables and adding them to the wok at the right time will help ensure success. It is important that you cut the vegetables into uniform sizes before stir-frying. So if you are incorporating asparagus spears and red bell pepper, both vegetables should be sliced into pieces the same size as each other. And, due to density and moisture, some vegetables take longer to cook than others. Therefore, you will need to add certain vegetables in stages, starting with those that require a longer cooking time. For example, broccoli will take longer than zucchini, so add it to the hot oil and start cooking before you include the squash. Because you are cooking on such high heat, there is a risk of burning your stir-fry. There are two ways to prevent this from happening—one is to keep moving the vegetables around the wok or pan so they don't sit long enough to overcook. The other is to splash them with a bit of Chinese rice wine, dry sherry, or water while stir-frying, but only if you notice the vegetables becoming too dry during cooking. Once you have mastered the stir-frying technique, and have found one or two recipes for sauces that you like, you can whip up a vegetable stir-fry easily, without a recipe. But in case you need some inspiration, no worries—there are plenty of delicious vegetable stir-fry dishes to choose from. Asparagus stir-fry combines the vegetable with mushrooms and bell peppers in a flavorful oyster sauce, while stir-fry baby bok choy keeps it simple highlighting this tender vegetable in a soy-ginger sauce. Reminiscent of Chinese take-out, stir-fried broccoli with garlic incorporates a cornstarch slurry to give the sauce that familiar texture. Ideal for a busy weeknight, a simple snow peas stir-fry has just five ingredients and can be on the dinner table in less than five minutes. And next time you serve steak, instead of a creamy spinach side dish, surprise the family with a spinach with garlic stir-fry—the drizzle of Asian sesame oil will have everyone asking for more. Have nothing in the fridge except for a head of lettuce? Believe it or not, you can make a delicious lettuce stir-fry, turning what is usually eaten raw and crisp into something tender with a bit of umami.